Marlinbooking.co.id builds business in the largest archipelago country in the world. Startup headquartered in Batam Island, Indonesia, bringing online sea transport ticketing app right from the Strait of Malacca. Co-Founder Marlin Booking, Ali Sadikin, said self check-in machine serves as customer service for boarding pass, white card and dispense tickets. 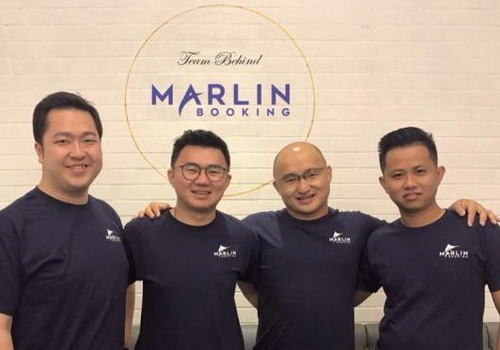 Marlin Booking said it has set up a machine to replace the role of customer service at the ferry terminal and in the future will be available in hotels and shopping malls. Startup established by Sadikin and Dede Saputra in January 2017 has become the first operator in Indonesia to serve online ship ticketing. "We are the first application to order online ferry tickets in Indonesia," said Sadikin. Apps serving ticket purchases are much cheaper and faster than offline purchases in ports that are hard to reach, long lines and complicated procedures. Users download apps via iOS and Android to book sea trips using smartphones every time. Currently ferry ticket booking time is only 15 minutes for Batam-Singapore and Batam-Malaysia route. Sadikin said the plan in the near future to add routes across the island of Sumatra and within the next two years will reach across Indonesia. Marlin Booking uses self check-in machine to verify a ticket that will help costumer issue boarding pass, white card and others. This machine is for the first stage only at the ferry terminal, but in the future will be available in hotels and shopping malls. "Passengers just put the card into the machine for verification. We are pushing conventional ferry systems to transform into online systems," Sadikin said.